Is it time to boot the box-kick to touch? Something may need to be done generally in the game to reduce the prevalence of a tactic that, although contributing to the successes of teams such as Ireland and Saracens in recent years, does nothing for the attractiveness of the rugby spectacle. 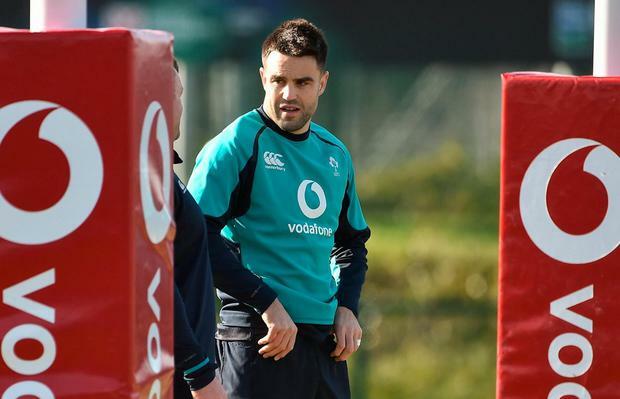 Some feel that there is nothing wrong with the tactic, one that has underpinned the rise of both Conor Murray and Ireland towards a pre-eminent place in world rugby, even if that status remains slightly less certain this spring. However, others rail against a gambit that, akin to the long-ball tactic in soccer, is negative, denies audiences the opportunity to watch the sport in its purest form, and removes what should be a scrum-half's primary skill, passing. At its heart, rugby is a handling and running game; kicking has always had its place but now it seems to be all over the place. Ireland and Saracens have become world-class exponents of the kicking game - it has brought both sides enormous success - but that does not necessarily mean that the tactic should be cheered from the rooftops. Kicking, or rather good kicking, has become a winning tactic and the more teams win with that tactic, the more kicking becomes a base-line for performance. The trouble is that even average sides seem to adopt the tactic too, with little success, thereby not only ruining their chances of success but also what should be 80 minutes of entertainment. To be fair, Murray's ascent to greatness has not been restricted to his expertise with the boot; he has far too many rounded skills to be thus shoe-horned but, as England have demonstrated, sometimes one's greatest strength can be exposed as a weakness. But this is about a bigger picture than Ireland and the Six Nations. It is about the sport people want to see. There are subtle signs that Ireland are moderating their approach to this most ascetic of tactics. According to the official statistics, Joe Schmidt's side have become less reliant on the gambit. The numbers breakdown has demonstrated that, of all Murray's kicking in the championship so far (38), the amount of short, tactical kicks have been dramatically reducing - from 10 against England, dipping to just three against the Scots in week two. The figure rose marginally against Italy but, on a day when a capricious wind whipped around the Stadio Olimpico, he only chose the option five times, and indeed only kicked six times in all. Still, we would like to see the blight become limited. Preventing illegal blocking would be a start. Players deployed as screens are supposed to be behind the hindmost feet at the ruck or maul but just as in phased play, this rule is liberally ignored by officials. They are also ordered not to move in an attempt to obstruct the player trying to effect a block; again, this is routinely ignored as lumpy forwards loiter with seeming intent as if they are industriously rucking. They are doing nothing of the sort. There also needs to be a gap between those protecting the scrum-half; if they form an impenetrable shield and their nine runs behind them, there should be a penalty, we have been told. Again, it rarely happens. The effectiveness of box-kicks has been reduced in recent times, especially at international level, as back-three players become more proficient fielders, while teams are also crowding the tramlines or, as England did, blocking chasers. Enforcing the five-second instruction for a scrum-half to "use" the ball when it is obviously available - and not allowing him to twirl it endlessly with his studs as the grunts get into position - would also help, if it were ever enforced. We have yet to see this happen, though. Some have suggested far more radical alterations; more specifically for those teams who wilfully engage in the interminable process beyond their 22, rather than the occasional necessity to do so in order to defensively clear one's lines. For example, if the box-kick is effected outside the 22 from the base of a ruck or maul, why not allow the opposition the chance to regain possession with a scrum if their player catches the ball cleanly? It would seem it is time to re-balance the forfeit for what is effectively a 50/50 punt and allow the opposition much more leverage in attempting to limit the effectiveness of one of the sport's less enamouring tactics.